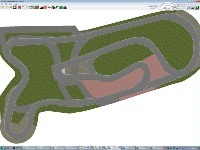 Currently only in the early stages of building this track... Eventually, I intend it to be released to the same standard as my previous track (Buckmore Park - http://www.rfactorcentral.com/detail.cfm?ID=Buckmore%20Park). Could be a while as I have other stuff going on at the moment, but hoping to release it sometime in the summer. He finished it ages ago. If you want to try it out, go visit Dave at IZONE at Silverstone. can i test it for you ? x2 U can't wait for it to come out. Any news on this project? It was the Class 1 favourite back in the day. I remember visiting Deavinsons workshop there in the late 70's early 80's. Looking forward to actually driving there....... Will it be soon? Please dont rush this! Buckmoor Park is my favourite rFactor track and hopefully this will be just as good, if not better. Will you release it in the summer of 2011? I can't wait for this one. Buckmore Park is one of my favourite rFactor kart-tracks, and like to drive on this one (Rye House), it is the track where Lewis Hamilton started to drive karts.